This post is in partnership with Little Tikes. 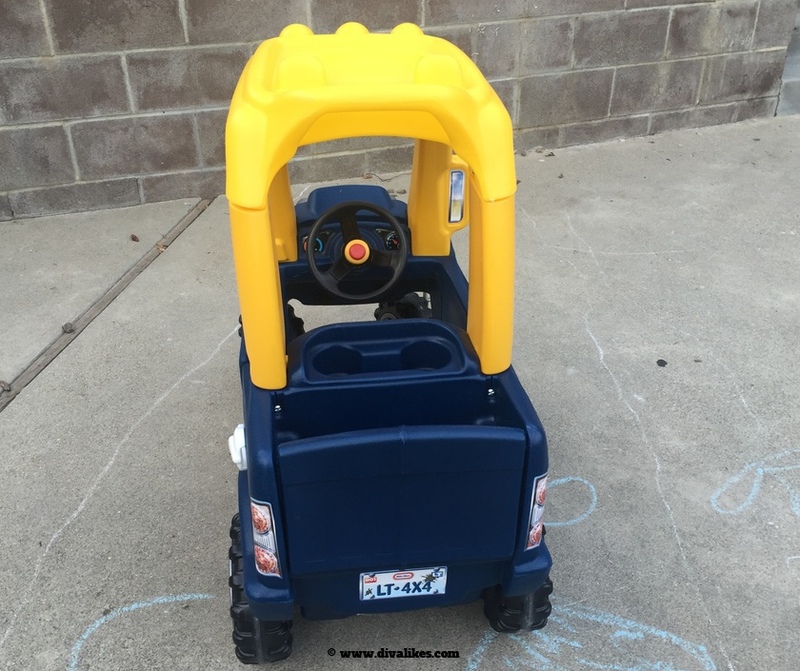 I received the Little Tikes Cozy Truck at no cost to facilitate this post. All opinions are mine. Whenever I step out to any store like Target or Walmart, the first place I go to is the "Kids Toys" aisle. I am always as excited as my son Aakarsh to check out new toys. After all, the 90's generation did not have these many wonderful and fun toys as we have today. So I always make it a point to spend time with Aakarsh while he has his own fun with the toys. I totally love watching him play and help him out when needed. Off-late the one brand name which is most commonly seen in the toys section is "Little Tikes." They have some fabulous kids toys which include active play, ride-ons and wagons, preschool toys, furniture and baby toys. Among the ride-ons, I found Little Tikes Cozy Truck most impressive as it has a fun element attached and you will agree just by the look of it. 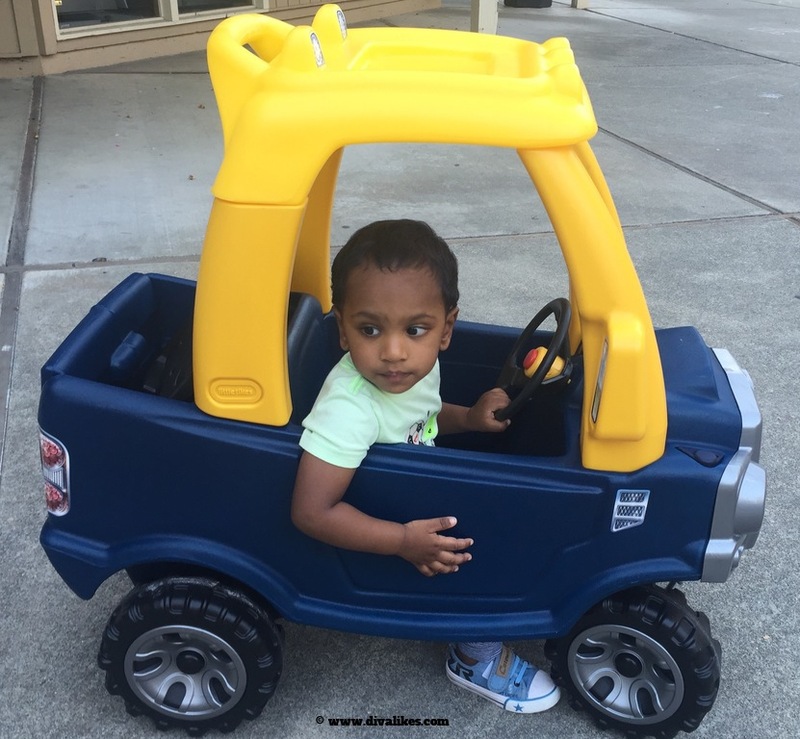 So when I received the Cozy Truck, my happiness had no bounds as I was sure Aakarsh would love it. Cozy Truck is available at Toys "R" Us and other leading online retailers at $89.99. This is a kids truck which is completely styled for hard-working kids to have a perfect ride. The package arrived with a number of parts which needed to be assembled. We decided not to show the truck to Aakarsh till it was all ready and my husband took up the job to put it together as quickly as he can. Overall, the assembly was not tough as we had a detailed instructions manual and the right tools in hand. Once the Cozy Truck was ready, we showed it to Aakarsh and he just couldn't wait to go out and ride it. The truck is suitable for kids aged 18 months - 5 years. Aakarsh is now almost 20 months old to have his own ride in the Cozy Truck! It is easy to get inside the Cozy Truck as the driver's door opens and closes. 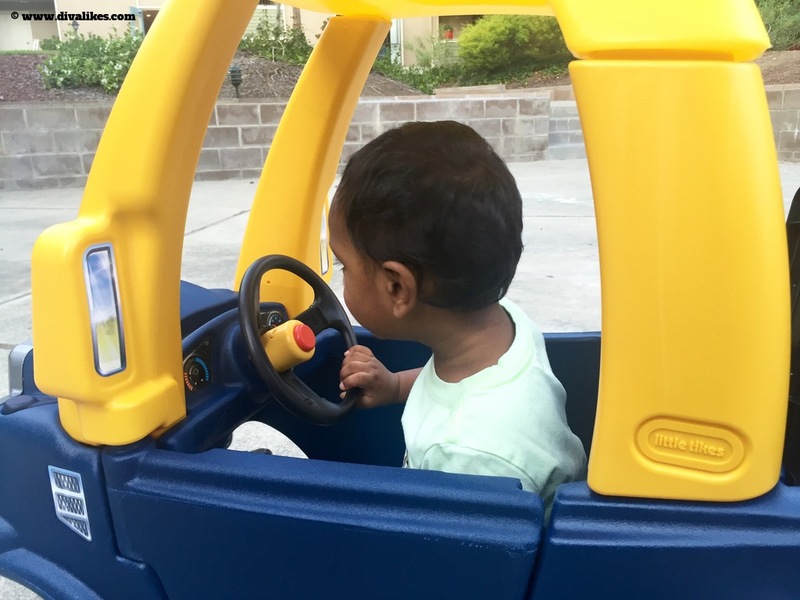 Since it is all new and if your little one is not ready to ride on their own, you can put the floor board to keep your child's feet protected while you guide them. This is a great feature given the fact that you can start using this truck as early as 18 months. Since Aakarsh was happy to keep his foot on the floor, I removed the floor board. The foot-to-floor format is easy to start and stop the vehicle. He thoroughly enjoyed moving it around under our guidance. 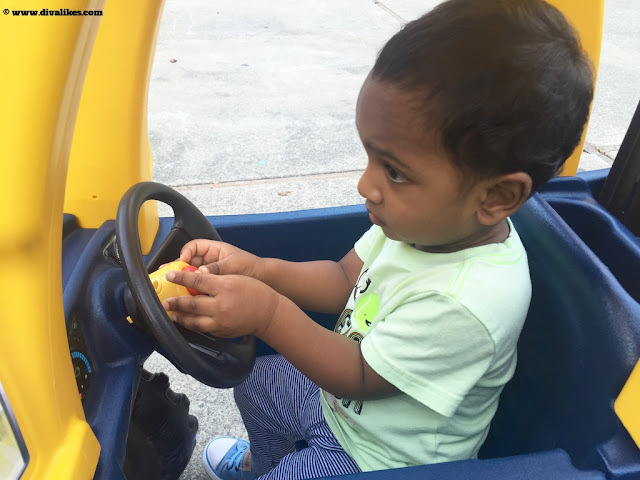 Now let's talk about the favorite part of the Cozy Truck which Aakarsh enjoyed the most - colorful dashboard with a steering wheel and a working horn. I lost count on the number of times he was honking as if he was stuck in traffic. He was all at it! I am sure that the kids are going to have lots of entertainment in using this feature. It works with "LR44" Button Cell batteries which are again easy to find at any local store. The truck also has a flatbed with a drop-down tailgate which makes all the loading and unloading easy. This is going to be of help in the days ahead when Aakarsh may have his own tailgate party with his friends' gang. The Cozy Truck has a gas cap which opens and closes. My little driver is going to fill up the gas at his nearest gas station very soon! The wheels of the truck are quite durable and work great even on rugged paths. So be it is your backyard or park, it is time to get your toddlers and preschoolers ride this truck-styled toy and have a fun time. The weight limit of the truck is up to 50 lbs, so this is going to be a long time riding partner for your child. 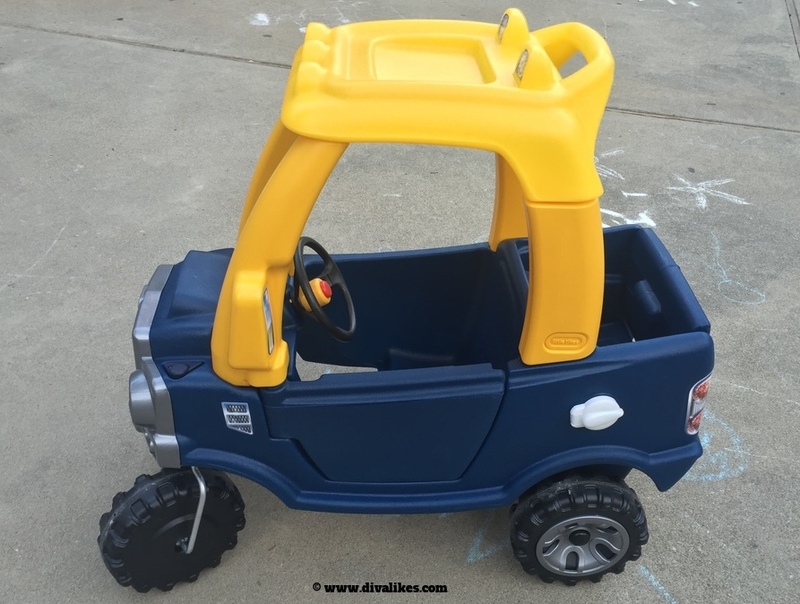 You can find more details about Little Tikes Cozy Truck on their website www.littletikes.com. 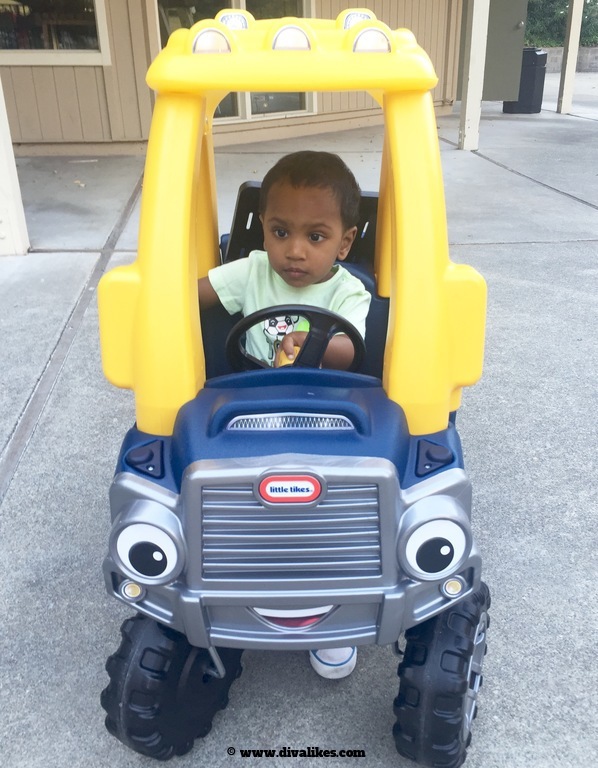 Aakarsh loves his Little Tikes Cozy Truck and as parents, we enjoy watching him ride his own truck. 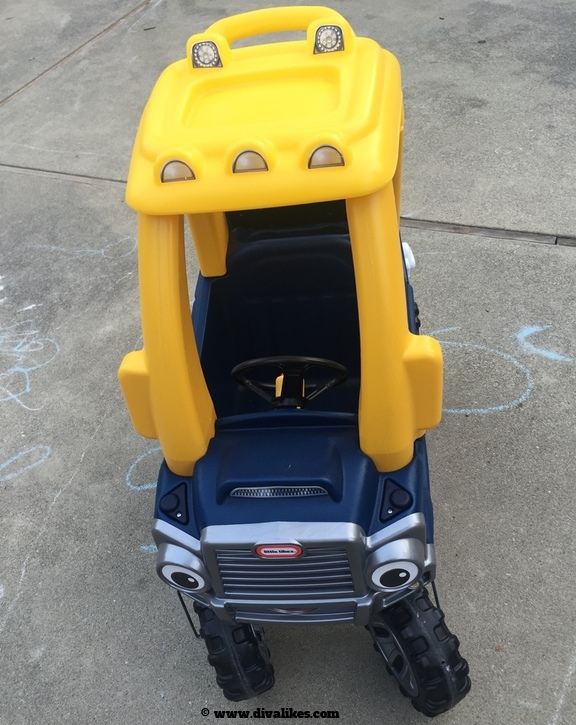 Get yourself this amazing truck and encourage your child to start his own ride.